The picture above is the Faliro Beach Volleyball Stadium in Athens, Greece. The very stadium that served as a backdrop to the 2004 Olympic volleyball competition. What happens to these venues after the medals are all distributed and the crowds disperse? Some, if not most, of these places are built specifically for the Olympic games, costing the host city millions of dollars. Sadly though, when the games are over these places cease to serve much of a purpose. They end up falling in ruins. Just modern day ghost towns. Where for some, dreams were once both realized and crushed all in the same day. 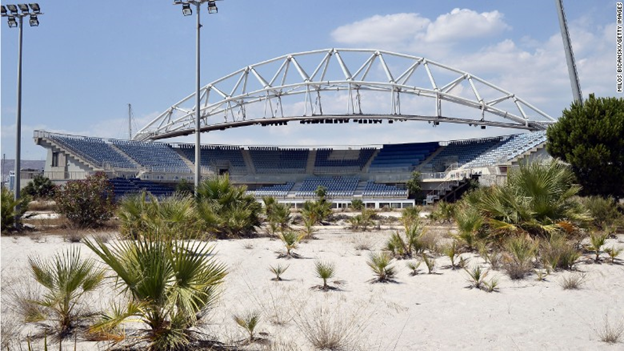 For Greece though, the question of what to do with this crumbling stadium has finally been answered. They have decided to give their volleyball ghost court a new lease on life, a second chance at victory, if you will. It seems these days Greece is in desperate need of judicial buildings. So desperate in fact, that most legal proceedings see lengthy delays in being heard and are even sometimes held in makeshift courtrooms or prisons! In order to rectify this obvious problem Greece has decided to transform this once glorious venue into yet another court where dreams are often realized and crushed in the same day- a court of law. Instead of the clank of gold, silver, and bronze medals being hung around the sweaty, sun kissed necks of professional volleyball players there will be the clanking of cuffs and the pounding of gavels. Oh, there will still be a judge and spectators all right but not the kind that come together to witness a victory, most times this venue will see human defeat. Still, I think it’s good that this venue will live on in the name of justice- I mean at least it’s still a court, right?